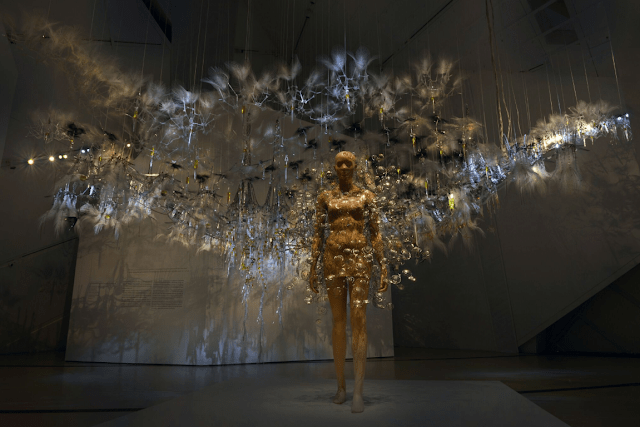 Nature, fashion and technology fuse together in an innovative two-part exhibition showcasing the futuristic designs of Dutch couturier Iris Van Herpen and the interactive architecture of Canada’s Philip Beesly. Parallel shows, Iris Van Herpen: Transforming Fashion and Philip Beesley: Transforming Space, are at the Royal Ontario Museum until October 8 and are a must-see for anyone interested in conceptual design as it relates to the human form and its relationship with both man-made and natural environments. Van Herpen and Beesley have partnered on a number of projects since 2012; the ROM presentation – consisting of a touring exhibition of Van Herpen’s avant-garde designs, organized and curated by the High Museum of Art in Atlanta and the Groningen Museum in the Netherland’s and two sculptural “living labs” which Beesley created with a team of pioneering researchers – represents their 11th collaboration. Beesley joined forces with the internationally acclaimed fashion designer after discovering that Van Herpen had drawn inspiration for one of her collections from the installation he created as Canada’s representative at the 2010 Venice Biennale. The ROM show highlights the impact of their artistic association with Dome Dress, a piece the museum exclusively requested from Van Herpen, who designed it for her 2017 Aeriform collection in collaboration with the Toronto-based artist and architect. Equal parts fashion and sculpture, the gravity-defying silhouette combines over 300 pieces of zinc-coated steel with laser-cut forms which have been hand-molded into lacy three-dimensional domes that bubble and float around the body. A film documenting the commission, created by fashion filmmaker and art director Stylianos Pangalos and shown as part of this exhibition, traces the evolution of the dress through a series of scientific experiments initiated by collaborators for developing their ideas. 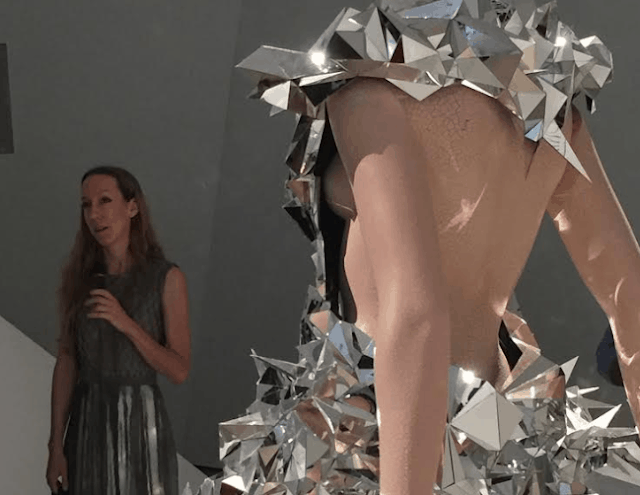 “The Dome Dress,” says Beesley, who with Van Herpen lead a private media tour of the exhibition in advance of its June 2 public opening, “creates a hovering, scintillating world that wraps all the way around the body, carrying the element of light. Each tiny bit of movement turns into light that reflects as it moves around us.” Shown at Paris Couture week in the fall, Dome Dress is now part of the ROM’s extensive permanent collection of Textiles & Fashion. The museum purchased it in deliberate defiance of its own policy prohibiting the acquisition of fashion not at least 50 years old. An exception was made, says Alexandra Palmer, the ROM’s Nora E. Vaughan Senior Curator, because the Dome Dress represents “extraordinary fashion . . . at the extreme edge of design.” But, and regardless how airy it looks, Dome Dress didn’t just spring out of the ether. The preceding Iris Van Herpen: Transforming Fashion retrospective, featuring 55 pieces from 15 collections, shows Van Herpen steadily developing the concepts that would inform the creation of Dome Dress from 2008 through to 2015, the year of the exhibition’s original creation. 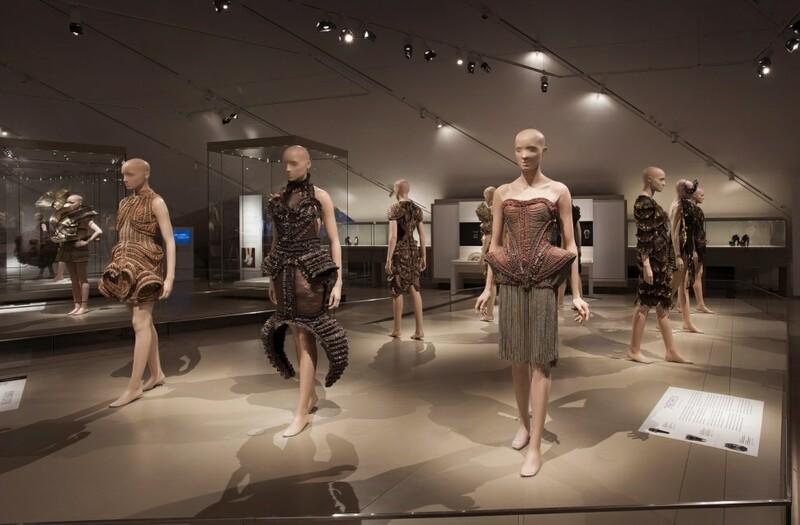 Sculptural, optical, experimental in design, process and materials, Van Herpen’s fashions are more than just clothes. At the ROM, they occupy a section of the museum all their own, appearing not unlike the skeletal forms and carapaces in nearby galleries housing fossilized remains of prehistoric animals. Van Herpen uses novel technologies to get her unusual effects, including 3D printers and laser cutters. But as the designer emphasized during the recent ROM tour, much of the work is still hand cut, draped, sewn and assembled. Computers help realize ideas rooted in human experience.